Current shows by Tom Denlinger (Terrain) and Victoria Fuller (Packer Schopf) bring to mind the opening scene of Blue Velvet. At first glance, their works seem friendly with their eye-catching colors and curious configurations. But on closer look the viewer senses something more menacing. 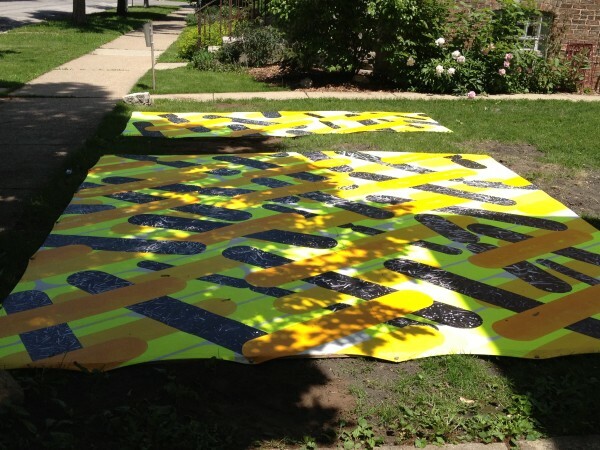 Let’s start outdoors with Denlinger’s installation, When Worlds Collide: The Kingdom of Monera @ 710 S. Highland. The work consists of two panels (acrylic and paper on canvas), one larger than the other with a swathe of grass between them. 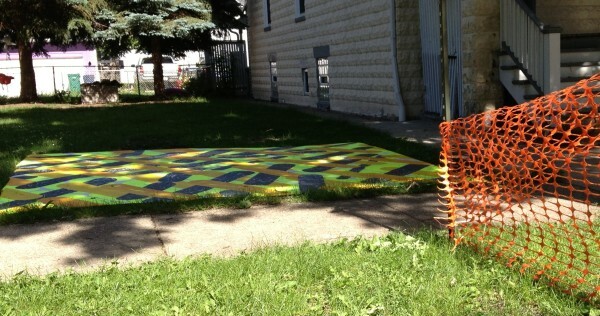 The panels are stretched across the lawn of an empty lot between two early 20th century houses. The installation measures 12 ft. x 19 ft.
Denlinger covers the canvases with large, layered forms, shaped like capsules or bacteria. The layering hints at perspectival space. But flatness prevails, especially since viewers look down to see the work. Just as scientists use fluorescent dye to study bacterial activity with fluorescent microscopy, Denlinger uses yellow-green fluorescent paint to distinguish a subset of the forms. Other elongated oval forms are painted taxi-cab yellow and emergency orange, or are black and white photographs affixed to the canvas. What’s more, the intense colors trick eyes into seeing the white as purplish, as if under black light. Chicago’s residential streetscapes, i.e., parkways, sidewalks, front yards, and lawns intrigue Denlinger. On and off over the past couple decades his work has explored this Möbius strip of public and private space. With his Terrain show he occupies the very space that fascinates him with a work whose dimensions replicate the front yard of Terrain founder, Sabina Ott. The concept of umwelt, local or surrounding environment, developed in the 1930s by Jakob von Uexküll, a biologist and pioneer of biosemiotics, figures in the thinking behind Denlinger’s When Worlds Collide. Umwelt is the totality of an environment as subjectively perceived and experienced by an organism. Since it’s subjective, another’s umwelt whether familiar or not is essentially foreign territory. But von Uexküll proposes that it’s possible to better understand alien environments by inventing “images” of them through art or photography. Of the many umwelts Denlinger might have chosen to image, his work brings us the human and the microbial. In fact, the Kingdom of Monera isn’t a legendary land, but rather the taxonomic realm of one-celled organisms, of bacteria. The collision between the umwelts of bacteria and humans sprawls across his installation. Discarded cucumbers fill the black and white collaged photos, Romanian scapegoats of a lethal outbreak of E. coli in Europe. When Worlds Collide is a skewed reference to the expansive, energetic, and frequently optimistic space of modernist abstraction. Denlinger’s is a distinctly twenty-first century umwelt. 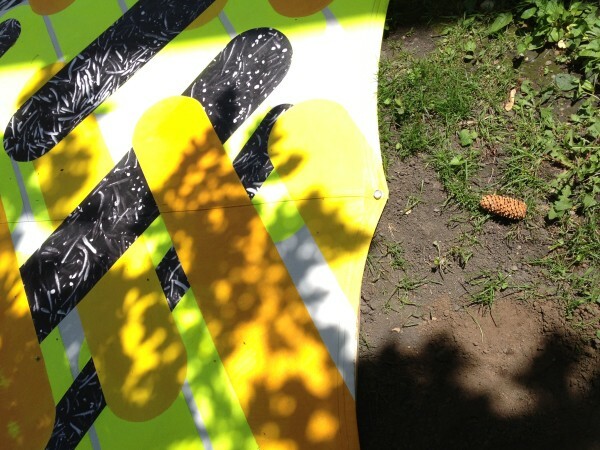 Splayed next to the sidewalk in living color, the work can’t but grab the attention of passersby. And in exchange, Denlinger’s installation—staked to the ground and speckled with dirt, crawling with ants, fading under the June sun, and changing hue in the long twilight—evokes a lifeworld all its own. Fuller is known for work that uses everyday objects, e.g., electrical cords and outlets, doorknobs, faucets, books, and shoes, to create sculptural works that can be metaphorical, allegorical, and whimsical. For example, her 2001 exhibition at the Chicago Cultural Center included Bad Plumbing (2001), a sculptural installation made of copper pipe, mop, gourd, suitcase, rope, books, horn, microphone and sound. Nature2 diverges from this established practice in that Fuller combines everyday objects, and particularly pipes, faucets, and hoses with representational objects of her own creation. 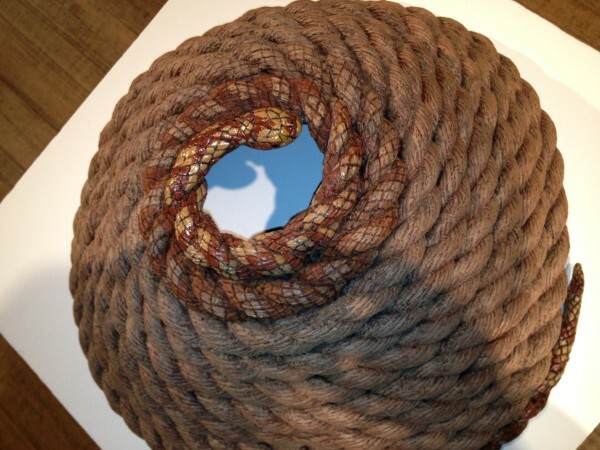 Unlike Bad Plumbing where she used a large coil of real rope, Rope Trick (2014; resin, epoxy clay, and acrylic; 18 1/4″ diameter x 8 1/2″) looks like real rope—except the coil’s start and finish morph into the front and end of a snake. It’s Fuller’s twist on Ceci ne pas une pipe. In contrast to Denlinger’s exploration of perception and subjectivity, Fuller investigates complex systems invented by humans with processes and effects that permeate our daily lives. She explicitly takes on the behemoths of industrial agriculture, food production, and resource extraction—and their collisions with nonhuman creatures and systems. 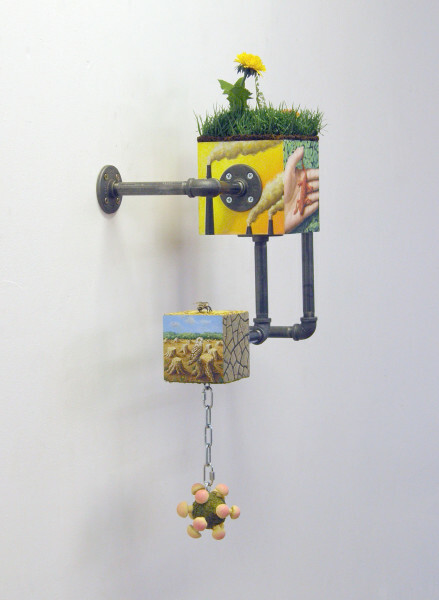 For example, Everything Is Connected (2014; wood, acrylic, plasti-clay, artifical plants, chain, and gas pipe; 24″x30″x6″) is the first sculpture inside the gallery’s entrance and could be the show’s subtitle. From its subterranean fungi to the dandelion popping up on top with spewing smokestacks in between, Everything Is Connected offers a 3D portrait of global warming. 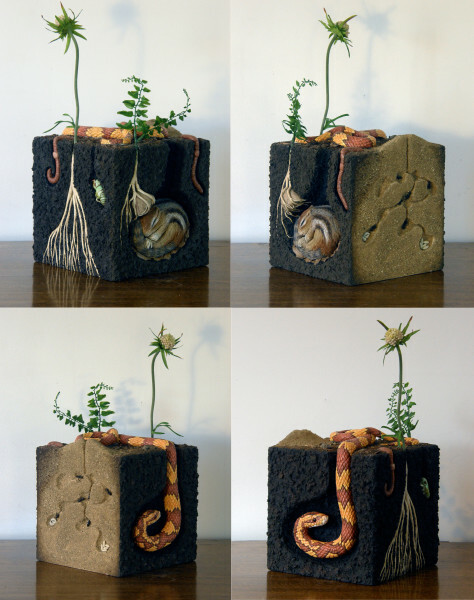 Deep Down (2014; carved wood, epoxy clay, wooden cube, gas pipe, and acrylic; 16″ x 8″ x 8″) can be seen as a riff on cubism, using five faces of a cube to reveal multiple perspectives on life above, on, and beneath the ground. A chipmunk is curled up and cozy in its burrow and ants carve their passageways underground. Plants shoot up and their roots reach down while snake and earthworm straddle above and below. There’s no sign of human activity and nothing seems amiss or at risk. Fuller draws on the visual languages of the educational diorama, mechanical schematic, and flow chart, as well as a host of materials and a lot of ingenuity and wit to create the show’s nine mixed media sculptures. 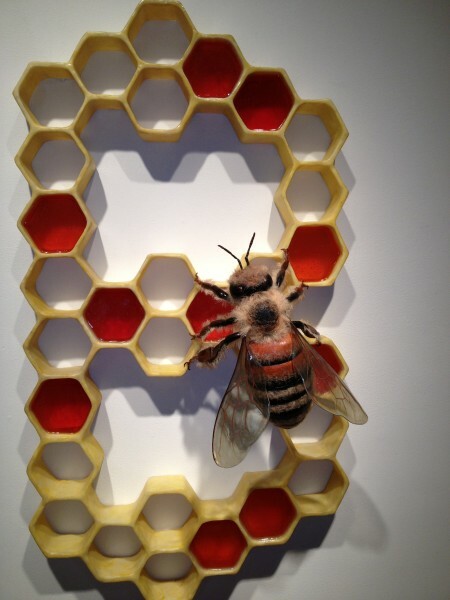 With its solitary bee and empty honeycomb cells, Spelling Bee (2014; craft fur, epoxy clay, acrylic, resin, mylar, and chloroplast; 33 3/8″x 19″ x 2 1/2″) combines organic form with tactility, fuzzy and smooth, and an ecological reference to complete colony collapse, an epidemic afflicting honeybees. 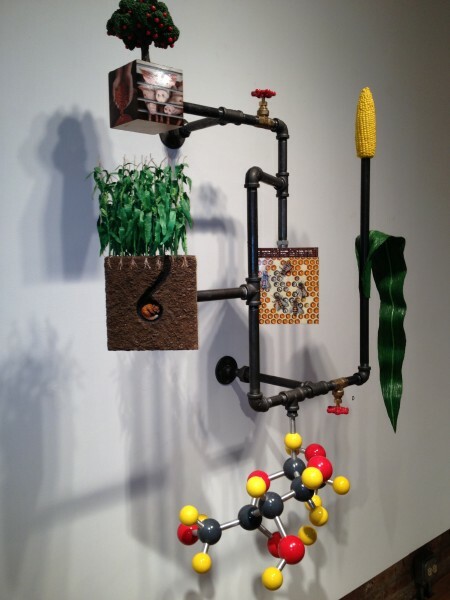 Factory Farm (2014; wood, epoxy clay, wooden cube, gas pipe, acrylic, resin, found objects, paper, and metal tube; 45″ x 34″ 17″) is particularly apropos for an artist based in Chicago, the corn belt’s metropole and profit center of what environmental scientist Jonathan Foley calls the corn system. Fuller creates a compelling narrative of the system’s moving parts, complete with feed lots, pigs behind bars, colony collapse, GMO-corn, and a molecular model of high fructose corn syrup. I’m grateful to Fuller for prompting me to learn more about the corn system. For example, large-scale honey producers maximize profits by feeding honeybees high fructose corn syrup, and bacteria and fungi are two of the enzymes used by industrial bioscience to manufacture high fructose corn syrup, the gooey backbone of processed food. Fuller’s work brings to mind Margaret Wharton, another immensely inventive artist whose posthumous show recently closed at the Riverside Arts Center. 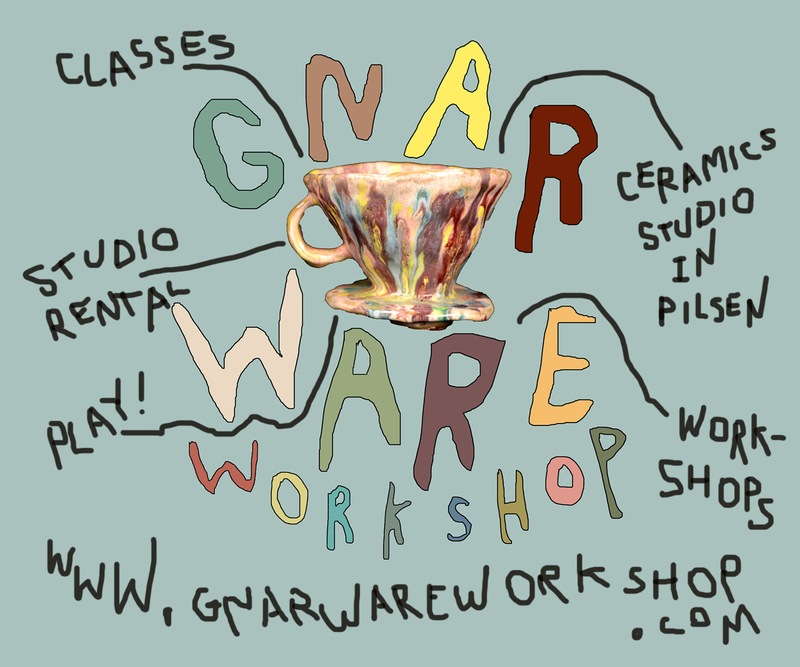 From the craft fur on the giant bee to the erector set fracking rig and plasti-clay mushrooms, Fuller’s artistry ranges across a wide repertoire of media and adroitly melds form and content. 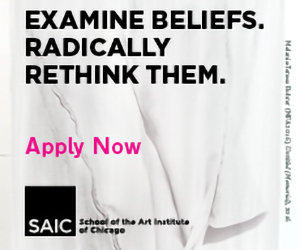 What’s more, her assemblages accomplish the rare feat of being at once playful and polemical.